The winds that lifted three inflatable bounce houses and injured 13 people in New York this weekend have put the focus on amusement ride safety as summer begins. A gust of wind picked up the inflatable bounce houses with children playing inside in Oceanside on Long Island. Parents and bystanders ran after the inflatable houses, trying to pin them to the ground but were knocked over. Eventually the houses came to the ground on their own. Adults and children were transported to the hospital, but no one was seriously injured. The incident follows two similar situations in Arizona. In February, an inflatable bounce house blew over a fence and onto a roof with two girls inside. One girl was seriously injured while the other suffered minor injuries. 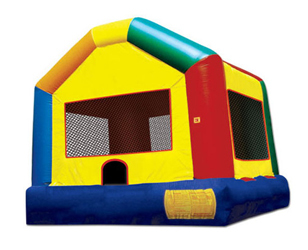 In April, four children were injured when the inflatable jumping castle they were playing in lifted up in a dust devil. The inflatable castle blew across a busy Tucson highway and landed in the median. In March 2010, a five-year-old boy died after falling from an inflatable ride at a Wichita, Kansas entertainment complex. The Consumer Product Safety Commission reports that between 2003 and 2007, 31,069 people went to the emergency room after being injured on inflatable amusement rides, including bounce houses and slides. Of these, 85 percent of those injured were under the age of 15. Injuries often occur when inflatables get unhinged or there are users of different sizes. Amusement rides and backyard toys are a staple of summer, but have come under scrutiny for their safety risks in recent years. In 2004, a 38-year-old man was killed on an amusement park ride at a Shrewsbury, Massachusetts church fair. Two other people suffered personal injuries. The Massachusetts Department of Public Safety investigated the amusement ride death and found that the man’s lap restraint was defective. The state found other riders had complained about the restraint in the days prior to the death. The state faulted the ride’s operator, Jaro Amusements, for not keeping proper maintenance records. The employee who supervised the ride was charged with manslaughter and received 2 1/2 years probation. The victim’s family filed a wrongful death lawsuit against Jaro Amusements, the supervisor and other parties. All amusement park rides must be inspected annually. Do not visit amusement parks or use inflatable rides in windy or rainy weather. When waiting in line for a ride, check the equipment. Are riders wearing seat belts and other safety equipment? Listen to people exiting the ride to hear if they complain about the equipment. If you have a bad feeling, step out of line. Amusement riders have a responsibility to exercise good judgment. This means obeying verbal instructions and warnings from ride operators, not riding under the influence of alcohol and drugs and not disabling safety devices. If you are injured on an amusement ride, the operator must report it to the state Department of Public Health. This includes injuries caused by small rented inflatable rides used at backyard birthday parties and other events. If you are renting an inflatable device or other amusement ride, ask the owner when it was last inspected. Carefully inspect the rented piece of equipment for excessively worn and damaged materials. Do not accept it in poor condition. Listen carefully to the set-up instructions provided by the company renting the device. Limit the number of users at one time to avoid injuries. Backyard trampolines may look fun, but they come with dangers. In 2008, trampoline injuries sent an estimated 100,000 victims to emergency rooms with serious injuries such as spinal cord injuries, broken bones and head injuries. In some cases, victims have been permanently paralyzed. Never let children jump on the trampoline without adult supervision. Children under the age of 6 should never use a trampoline. The journal Pediatrics calls children this age “top-heavy” and said when they fall on trampolines, they often suffer head injuries. Only one person should jump at a time. Do not allow flips or somersaults. The Consumer Product Safety Commission reports this is one of the leading causes of trampoline injuries. Install safety netting around the trampoline, but advise users the netting does not mean they can do flips or other unsafe maneuvers. Carefully explain they cannot bounce off it in any way. Cover the trampoline’s steel rim and springs with a safety pad so users do not fall through the openings. Do not allow people to sit on the safety pad. Users should step onto the trampoline and step off. They should never jump off. This could lead to trampoline accidents. Follow the manufacturer’s recommendations for when to replace parts. Different parts have different lifespans and failure to replace could result in serious personal injury.